Final dimensions of booklets produced by the BDF-e range from 76 x 120 mm (2.99 X 4.72 in) up to 260 mm x 356 mm (10.23 x 14.01 in) to a maximum speed of 4200 sets/hour. The BDF-e is able to stitch fold trim up to 22 sheets, stitches up to 55 sheets, and folds up to 22 sheets (88 pages) booklets without scuffing or marking. The BDF-e is compatible with several C.P. Bourg machines. With the Bourg Sheet Feeder (BSF), for example, the BDF-e can be connected directly in In-Line and Near-Line mode to multiple print engines such as Xeror and Océ/Canon and Kodak and can quickly produce booklets. Connected In-Line to the Bourg Bleed Crease Module (BCM-e), the BCM-e will perform the highest quality knife creasing, top and bottom bleeding. Adding the Square Edge Module (SQE) to the configuration will transform traditional stitch-fold-trim booklets into square edged booklets. Booklets produced are flat and easy to stack. With the BDF-e, we can load a job in one or both BST-e tower collators and be up and running on a job literally within one minute. And job changeovers are equally fast and easy. Having an in-house operation makes it possible to achieve both goals. It also means we can handle jobs at the 11th hour that often can’t be done outside. Plus, with the Bourg BCM-e(x) and BDF-e(x), we’re able to finish full-bleed marketing materials printed on our large-format iGen4 - something that even many commercial printers can’t do. If we didn’t have floor-space limitations, I would add a second Bourg Bleed Crease Module for our other iGen4. 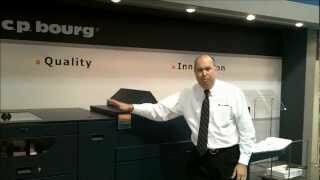 The color and accuracy of print from the iGen4 Press is superior even compared to the iGen3 Press, and every bit as good as the print from a Heidelberg press. Adding the Bourg BCM-e(x) and BDF-e(x) finishers ensure their finished products maintain that high quality. 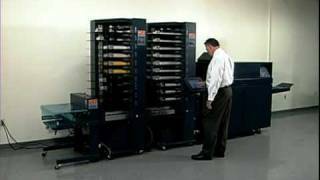 The Bourg BBF2005 binding and BDF-e(x) finishing equipment [in-line with a Xerox printer] has proven quite reliable, despite the fact for nearly seven years it has been used routinely 16 hours a day, five days a week. There’s not a lot of binding options out there that could keep up with the equipment I have right now. And we’re going to keep doing it the way we’ve been doing it, because it literally saves us millions of dollars.